Kayda and Thia Sandefur could certainly pass for twins. 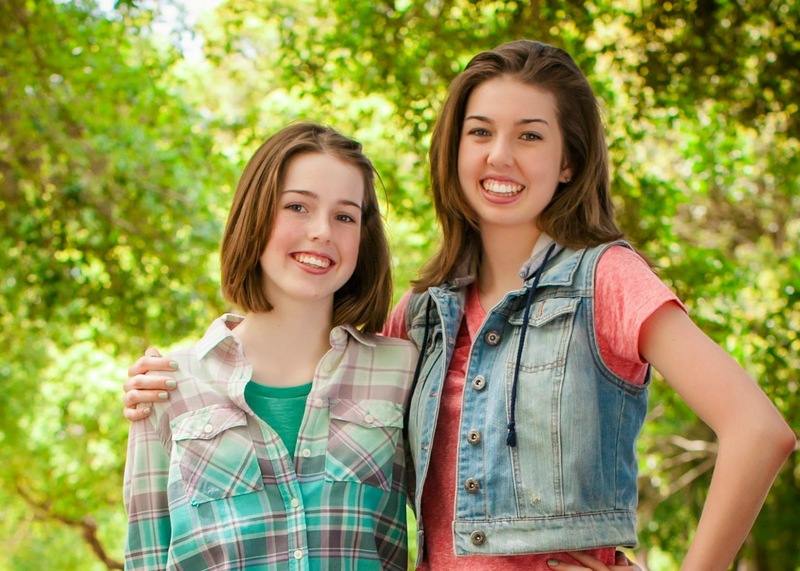 With similar short, bob haircuts and only a year and a half age difference, the two sisters from St. Petersburg are often seen together on Patel Conservatory stages in our theater productions. 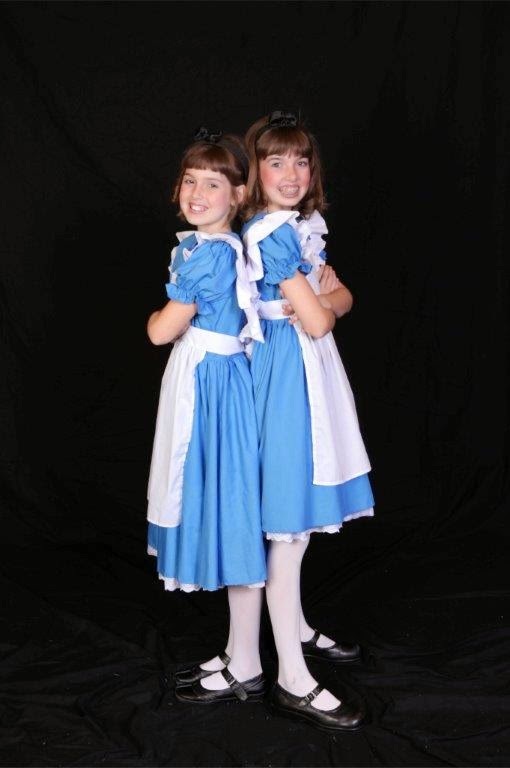 In their first Conservatory show, they were even double cast in the same role as Alice in Alice and Wonderland, Jr. Since then, they each have played a variety of roles in our theater productions year after year, including Once Upon a Mattress, A Little Princess and Oklahoma! “We’ve both had leads, and we’ve both been in ensemble, we’re just supportive of each other,” agreed Thia, 15. Kayda, left, and This in Alice in Wonderland, Jr.
in 2011. Photo by Soho Images. Although they look alike and perform in the same shows, and share inside jokes and sometimes finish each other’s sentences, the girls are each finding their own path at the Conservatory. In Alice and Wonderland, Jr., “the director worked with the girls to bring out each of their strengths,” said mom Kelli Sandefur. Working with different directors, choreographers and instructors over the past five years has inspired them to branch out beyond theater classes and into vocal and dance classes and private voice lessons. This summer, Kayda will focus on voice, participating in the Conservatory’s Voice Intensive, and Thia will focus on dance in the Junior Intensive. Thia took an interest in dance last summer when she got a chance to work with dance instructor Kelly King in Hairspray. On the Edge, April 2015. Photo by Soho Images. “She made sure I did everything very sharp. It was the most intense dancing I’ve ever done,” said Thia. That sold Thia and her sister on taking hip hop during the school year with Miss Kelly. Though they’ve picked up some dance along the way through theater experiences, neither had ever taken formal dance classes. “At the beginning of the year, we were nervous. But by the end of year, your confidence is so built up,” said Thia. Last year, she didn’t even know the Conservatory had a third floor. This year, she’ll spend two weeks in our third floor dance studios as she works on dance skills in the Junior Intensive. "I want to improve in jazz so I can take Just for Kicks next year." Ultimately, the two girls are striving for those triple threat skills that will land them professional jobs. “From auditions to callbacks, the Patel Conservatory has prepared them for what it’s really like in the professional world. When they go to other auditions, they don’t have the unknown fear factor,” said Kelli. The girls recently had roles as extras in the films Five Doctors and Dolphin Tale 2. “Improv, dance, singing, drama, you don’t have to go to different places to meet all those needs,” said Thia. For more information about dance, music and theater camps and classes, call 813.222.1002 or visit patelconservatory.org.